Hôtel Eggers - Central location in a historic building. In the heart of Gothenburg, this charming hotel is close to everything the city has to offer. 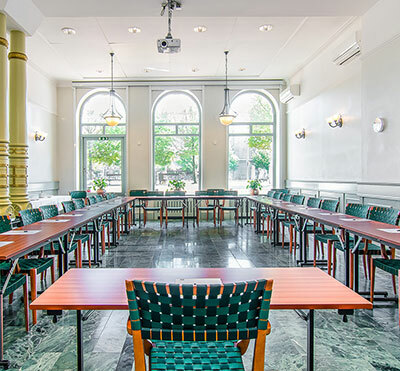 The Hotel Eggers is located only 78 steps from Gothenburg Central Station and boasts a great location for conferences, business travelers and tourists alike. Hôtel Eggers is one of Gothenburg's most prestigious hotels, and have been a hotel since the building was ready in 1859. The history sits explicitly in the walls. The hotel has 70 different and individually decorated hotel rooms of high standard. Some rooms are larger and more luxurious, others a bit smaller and more intimate. The rooms are located either against the crowded folklore on Drottningtorget or towards the hotel's own courtyard, with a quiet atmosphere in the middle of town. With antique rugs on the floors as well as stucco and crystal chandeliers in the roof, Hôtel Eggers offers an environment that really stands out. It is easy to meet at the Hotel Eggers. There are five conference rooms in varying sizes in an environment that offers peace and quiet despite its central location. Here you can combine effective meetings with experiences in Gothenburg city. The Queen Room is located on the ground floor and accommodates up to 60 people in a bright environment with large vaulted windows along one wall. In The Club, 30 people can meet, while The Director, Kajutan and Baretten are smaller rooms with seats for 8-12 and are ideal for meetings such as board meetings. In all the rooms there are projectors, whiteboard and flipchart, in the main room there is also a microphone available. Other equipment can be hired. Internet is available in all rooms and all guests have access to wireless internet throughout the hotel. Ice water and fruit is constatntly available to all conference participants. Eggers Restaurant & Bar is well known and has been there since the hotel opened. It offers a unique atmosphere, a classic kitchen with well-cooked food of fine ingredients served with personal service and care. The environment is derived from a Paris in the turn of the century's La Belle Époque, the timeless mood of days when the city's cafes, restaurants and art galleries where used as the guests living room. In summer, a nice outdoor dining is also offered. Conduct a good conscience at Hôtel Eggers! Nordic Ecolabelling guarantees good environmental work and conservation of nature. Have you been to Hôtel Eggers and want to give your own comments?